Tim and Rebecca: Married: Tim and Rebecca! We did it! 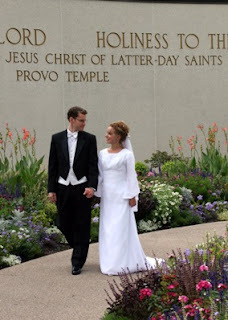 We were married on September 16, 2006 at 9:30 a.m. in the Provo Temple for time and all eternity! It was great to see so many of our family and friends there. Thanks to all for coming to see us. It was a chilly day; snow had dusted the tops of the mountains the night before, creating a beautiful array of colors as the trees had begun to change for fall. Upon exiting the temple, the weather, though brisk, was perfect. We were herded around and were made subject to sore cheeks and prolonged silliness by our photo- and videographers. (we'll share these photos once we get them!) And the heavens' timing couldn't have been more perfect, for the moment we finished our "modelling session" and headed to the luncheon, a cold rain/snow came pouring down. The luncheon was held in Spanish Fork at Rebecca's parents' Church meetinghouse. Served were delicious smokehouse meats, funeral potatoes (hey, everyone loves funeral potatoes! ), and leftover desserts from the previous night's reception. My sister Sarah sang "When I Fall in Love" with my uncle Nels Draper in an unrehearsed and "uniquely-performed" style ;). Next, three of Rebecca's cousins (sisters, even) sang Gershwin's "Who Cares?" (accompanied by Rebecca's mom), suprisingly unheard of previously by yours truly (a pretty big Gershwin fan), and now a favorite. We are living in Silver Spring, Maryland. I work in Reston, Virginia and Rebecca studies physics at the University of Maryland in College Park, MD. We are excited to have started our little family and can't wait to see it grow!